Just because I am curious, I thought I'll research Tilde's roots, like I did for Kenzo. Although I know her father was most likely Aapo vom Moseleck, I cannot get that confirmed to be certain. I do know though with certainty who her mother was: Cherry van de Rovihof. I couldn't even have imagined adopting a dog, just a week ago. When I rewind to the week just before Easter, instead of looking forward to some time off during those public holidays, I was bracing myself. Driving down to the shelter of "Dyrenes Beskyttelse" in Roskilde to meet Tilde, I wasn't sure we could have her home with us. Kenzo would be the judge of that, not me. But at least I was looking forward to meet Tilde. At last. As one of the first to see a picture of her as a week old puppy, and following her journey from the puppy mill to her rescue and into her new home, I finally had the opportunity to meet her in real life. With only 14 months on her age-belt, Tilde was up for adoption again. Hovawarts are generally considered to be a hardy breed, highly intelligent, trainable and very energetic. Hovawart breeders have done an excellent job at ensuring genetically unsound animals are removed from the breeding pool, so those diseases that are purely genetic are extremely rare. However, as with any breed of dog, occasionally health problems occur. It is important as the owner of a Hovawart to know what to look for and when to worry. 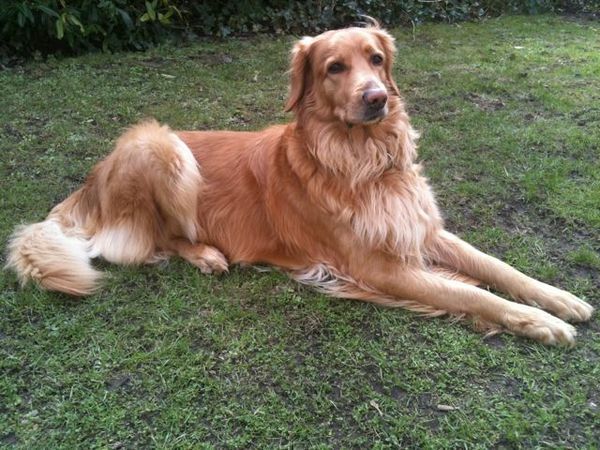 During 2004 a survey of purebred dogs in the UK attempted to identify important breed health conditions. The survey had a low response rate, but did have some interesting results (note Kenzo: the specific results for the Hovawart are here). Among the diseases identified in the survey, the more common and important diseases for Hovawarts are discussed below, with emphasis on what to look for and how to reduce the risk of the disease occurring in your beloved friend. Hip dysplasia rates are estimated to be below 5% in Hovawarts, mainly due to selective breeding. Unfortunately it can still crop up in any breed of dog despite ‘good’ bloodlines and no previous hint of hip dysplasia in the parents. Hip dysplasia develops due to an overall genetic design problem that leads to loose or lax hip joints and leads to erosion of joint cartilage and osteoarthritis. There is more than one gene involved and environmental factors such as nutrition and exercise have a big part to play in the development of hip dysplasia. Bones and joints are constantly remodelling, particularly during the growth phase of development, so what we are born with can be changed through nutrition and exercise. Overfeeding a growing puppy increases the risk of hip dysplasia in predisposed animals, so the key message is to ensure your puppy is not eating too much and is growing at a recommended rate. Your Vet can help you develop a good nutritional plan, but if you notice your puppy has wobbly bits, or a little tummy, you need to slightly reduce the amount you are feeding. Also avoid diet supplements, unless on medical advice, particular calcium. Large deep-chested breeds are prone to developing this devastating condition, for which early identification is extremely important. In simple bloat the stomach becomes full of gas and fluid, while in volvulus it rotates, blocking the blood supply to the stomach. Volvulus is fatal if left untreated and decompression and/or surgery must be performed as quickly as possible. Avoid feeding one large meal a day and, feed 2-3 smaller meals instead. Avoid strenuous exercise for 1-2 hours after eating, particularly after a big meal. Other risk factors include eating rapidly (there are special bowls that slow down eating for the gobblers, or you can place an upturned bowl in your dog’s plate to slow him down), being thin or underweight, moistening dry foods (particularly if citric acid is listed in the ingredients), feeding a diet that contains animal fat among the first four ingredients), history of aggression (laid-back happy dogs are less likely to bloat) and feeding from an elevated bowl. 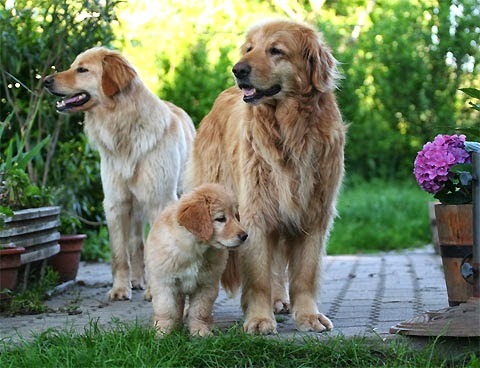 Having a family member with bloat also increases the risk factor of your dog bloating, so ask your breeder if they know of any cases of bloat, so you know whether to implement some preventative strategies. In general a dog should rest after eating anyway to aid digestions, so at the very least feed your dog morning and night and let him rest for at least an hour afterwards. Hypothyroidism is a disease that has insidious signs and is very easy to treat and relatively cheap to diagnose. Thyroid hormone affects metabolic rate and can affect almost all the organs and cells in the body. It is the most common hormonal or endocrine disease in all dogs. Often the signs are so gradual they are confused with the aging process, but on treatment affected dogs gain a new lease on life. If you have any concerns that your dog is slowing down ask your Vet for blood tests to check for this easy-to-treat condition. Hypothyroidism is caused by immune-mediated destruction of the thyroid gland and can cause a variety of signs. Ear infections are common in dogs that have floppy ears and can be seasonal in nature. The ear canal in the average Hovawart is approximately 10cm long and there is a sharp right angled turn. The combination of floppy ears, a dark, warm and humid environment can create the ideal environment for bacterial or fungal infections. Dogs that swim, have allergies or have hairy ear canals are also more likely to get frequent ear infections. Dogs that swim and get their ears below water level should have their ears cleaned regularly. There are many ways to clean your dog’s ears, and the main precaution is that if your dog is at risk of a ruptured ear drum, you should not put anything down the ear without the advice of a Vet. Generally a specialised dog ear cleaner is the only thing you should put down an ear canal. Never use cotton buds, as they will just push debris further down into the ear (and there is nothing worse than having the tip break off deep in the ear!). If your dog is prone to ear infections, ear cleaning on a fortnightly basis can reduce the frequency. You could also book in for a chat to your Vet about allergies to see if there is an underlying cause. Stand back and allow your pooch to shake out the excess ear cleaner and give a treat! Bio: With 7 years of small animal practice, Dr. Eloise Bright came to Love That Pet with as animal lover and advocate for all animals from baby birds to stray kittens. With two sons in tow, Eloise mainly practices in Sydney, Australia. Chat with her and the dog, Duster and cat, Jimmy on Google+.